Want to visit the most exciting city on the planet? Rio de Janeiro has a lot going on. The host of the 2016 summer Olympics and the 2014 World Cup, it's got the world's attention and everyone is watching. 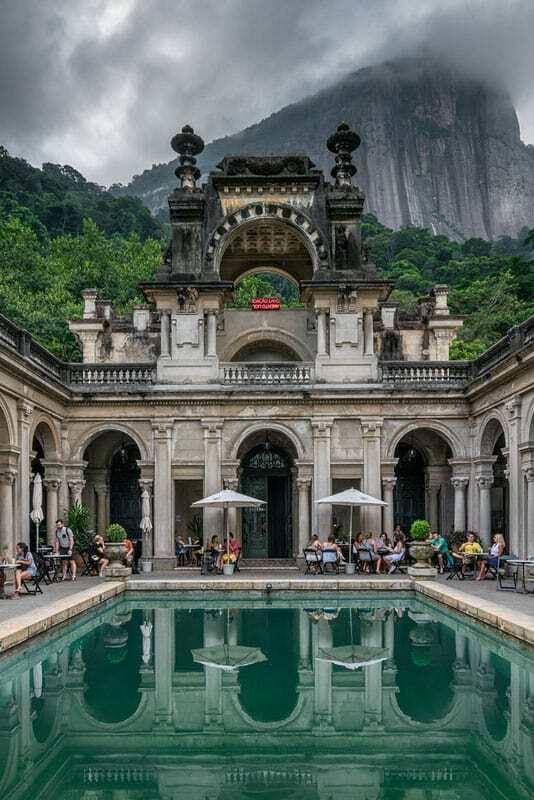 If you want to maximize your time in Rio, make sure to follow our tops picks of The 18 most excellent things to do in Rio de Janeiro. What are your favourite things to do in Rio? We aren't well-travelled through South America. We've only been to Peru, Ecuador and a bit of Argentina. We've touched on a few central American countries like Honduras, Guatemala and Belize, but when it comes to Latin American travel, we are lacking a bit. Now that we've added Brazil to our South American checklist, we feel a little more worthy of being able to say, "Yes, we've explored a good chunk of the continent." Out of the few countries we've visited, we feel that Rio is the most intoxicating city in South America, possibly the planet. The landscape alone makes it worthy of the most beautiful. Don't believe me? Check out all the things to do in Rio de Janeiro. Looking for the Cheapest Flight to Rio? Enter Your Dates Below and Find out! 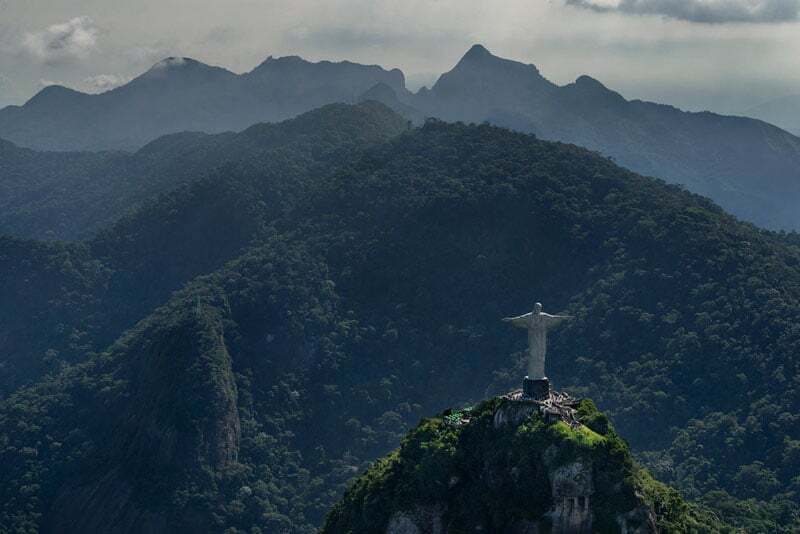 One of the most iconic things to do in Rio de Janeiro is to visit Christ the Redeemer. It's one of the most recognized in the world. When picturing Rio, this is what everyone envisions. Christo Redentor stands proudly over the city at the top of Corcovado Mountain. To visit you can hike up the mountain, take a minibus or enjoy a scenic train ride. Standing at 38 metres high, this is one imposing statue that is not to be missed. We highly recommend going in the morning or at sunset. Midday is extremely busy with tours. 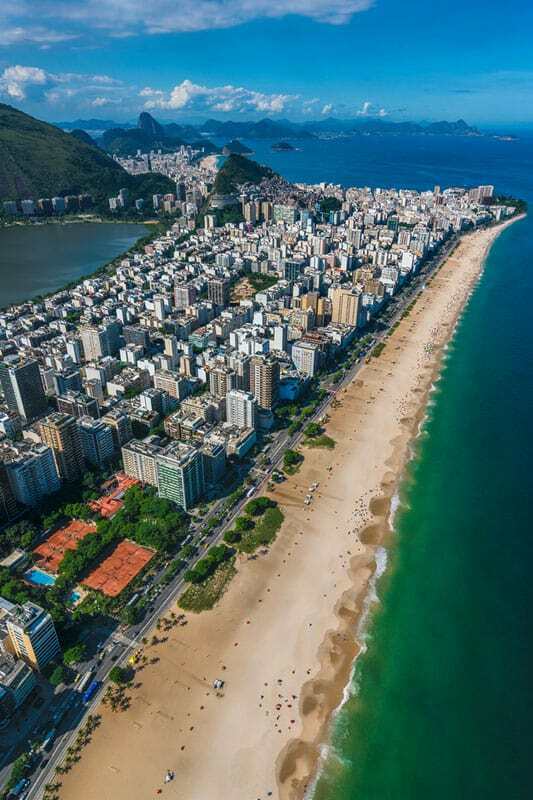 It's the most famous beach in the world and a trip to Rio wouldn't be complete without spending at day at Copacabana. This four km iconic beach is filled with energy and excitement. Vendors and restaurants line the sand and a wide paved pathway along the road makes for an easy stroll. What we love about Copacabana Beach is how there are no hotels on the beach, they are all located across the road. 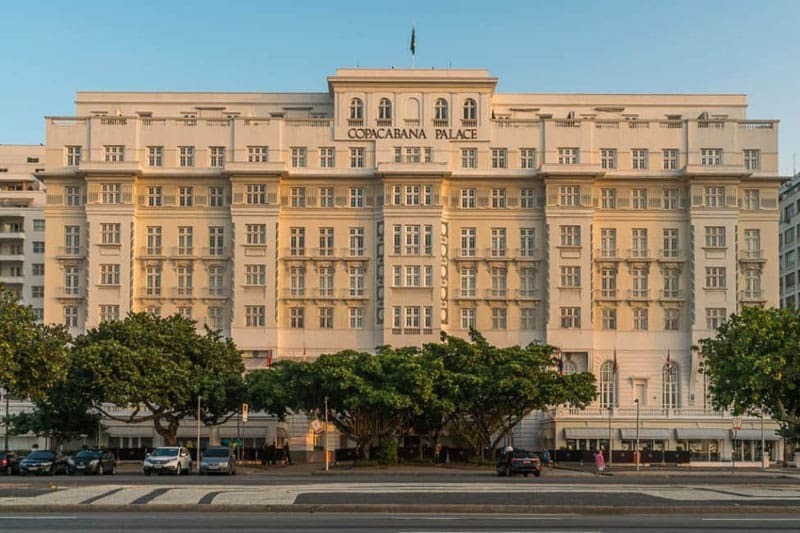 The most iconic hotel is the Belmond Copacabana Palace Hotel. This hotel was the first in the area dating back to 1923. It's almost as if the beach life built up around the Copacabana Palace. The art deco building takes up an entire city block and is the epitome of old-world luxury mixed with urban chic. Sugarloaf Mountain rises 396 m over the Rio Harbour and really contributes to the aesthetic of the city's spectacular skyline. It is named so because it resembles a Sugarloaf; a hard packed bunch of sugar that looks like a cone. Sugarloaf mountain is an excellent spot to watch the sunset and take in the panoramic views of the city. Getting to the top involves taking two cable car rides dangling over the gap between two mountains. The ride is a thrill as it takes you to the top of the city. Skip the Long Lines at Sugarloaf Mountain with this Ticket! "Tall and tan and young and lovely the Girl from Ipanema goes walking..." Oh how I love that song. It is the second most recorded pop song after Yesterday by the Beatles. 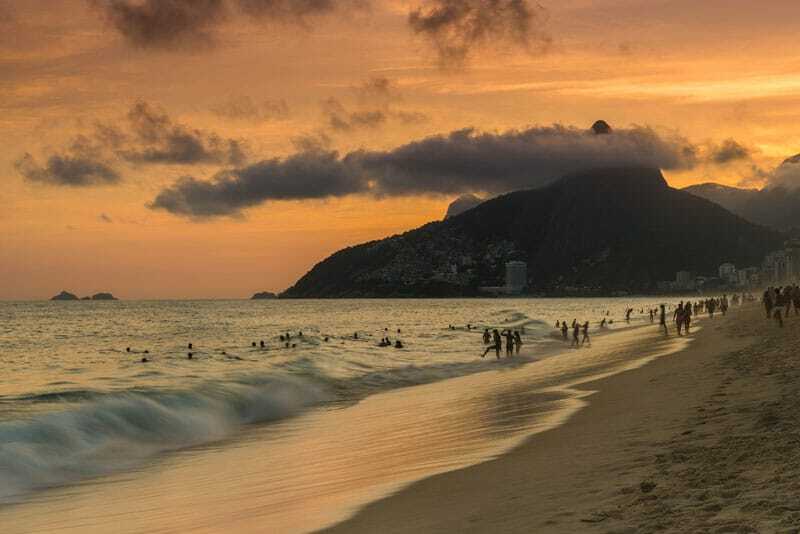 Ipanema Beach is essentially attached to Copacabana Beach located just around a pier. This is another long stretch of Rio sand where people play beach volleyball and bask under sun umbrellas. Just a block up from the beach, you can visit the Girl From Ipanema Cafe where the famous song was penned. Ipanema is more of a residential area than Copacabana so there aren't as many hotel choices, but there are three beach hotels. We stayed at The Sol Ipanema which offered some great views from its small rooftop pool and patio. 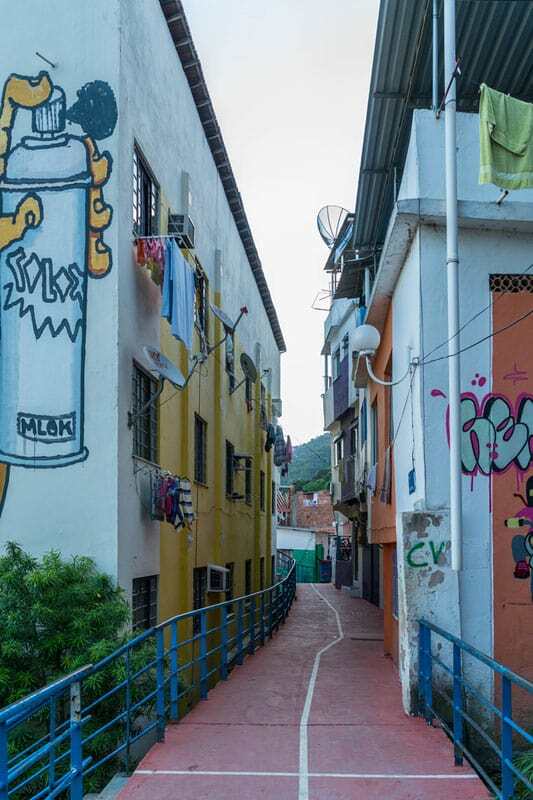 If you want to learn more about Rio culture, take a favela tour to visit local communities. There are 800 favelas in Rio and nearly 1.5 million people inhabit these shanty towns. Favelas used to be overrun by drug lords and gangs, but they are slowly being pacified and now there are a handful of favelas that are safe for tourists to visit. Colourful Favelas are being cleaned up. 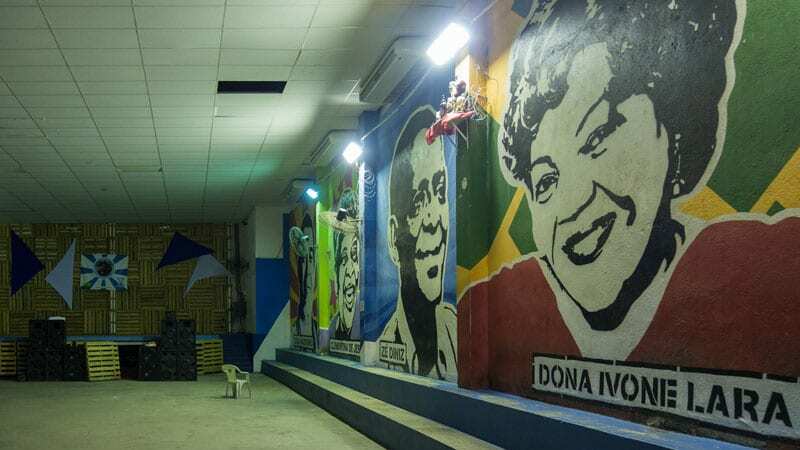 We visited the Santa Marta Favela with Rio's Urban Adventures and saw where Michael Jackson filmed his music video "They don't care about us" But more importantly, we saw how the community has changed from crime to community. There are businesses, community centres, and outdoor gathering squares. Favelas are coming around with proper electricity, garbage pick up and a trolley has been installed to transport passengers and goods up the steep hills. Choose Your Favela Tour Now! 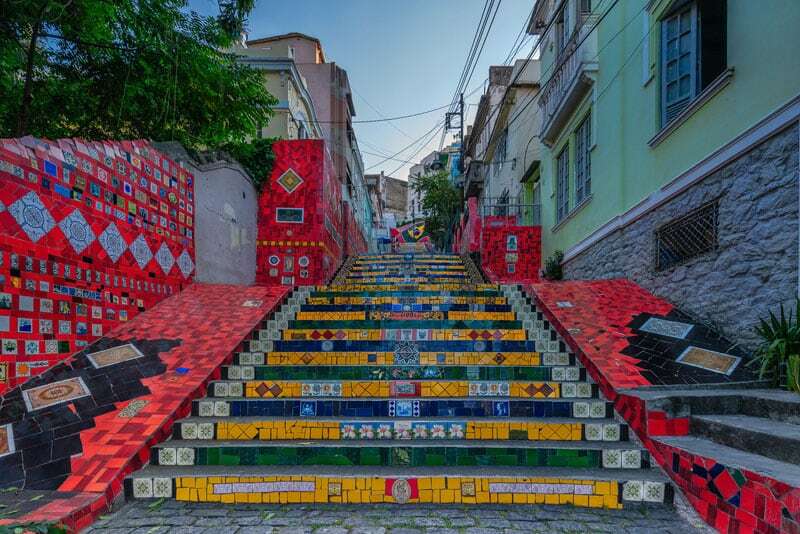 The Lapa Steps are a popular attraction where visitors can climb the 215 colourful tiled steps that lead from the Lapa neighbourhood to Santa Teresa. Chilean Artist Escadaria Selarón started laying tiles on the dilapidated steps that ran in front of his house. He laid colourful tiles from around the world until his death in 2013. There are more than 2000 tiles from more than 60 countries from around the world. The steps have turned into a masterpiece. They are truly a work of art brought to life by a passionate artist. If there is one city you should do a scenic flight in this world, it is Rio. Rio's landscape is spectacular with huge mountains framing the city. Long white sandy beaches stretch between Sugarloaf and Two Brother's mountains. 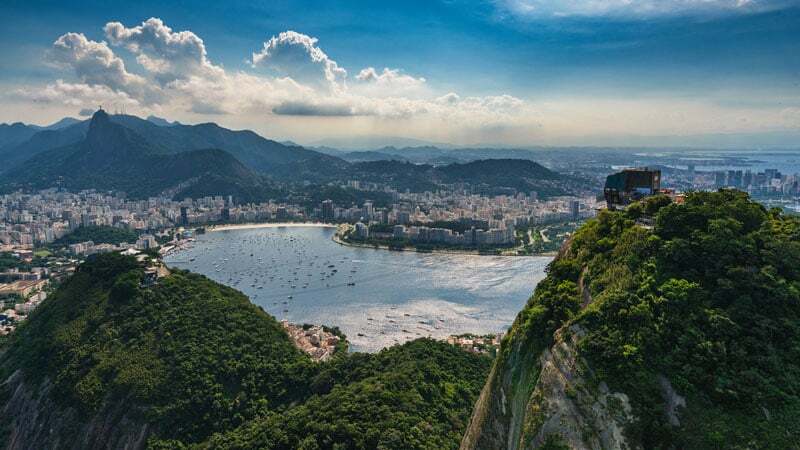 With a blend of urban sprawl, colourful hillside favelas, jungle, ocean, and beaches, this is one of the most beautiful cities on earth and a helicopter tour lets you truly take in the scope and scale of Rio's landscape. Book Your Helicopter Tour NOW! One of the best things to do in Rio is a Helicopter tour: Check out our full post and video here. 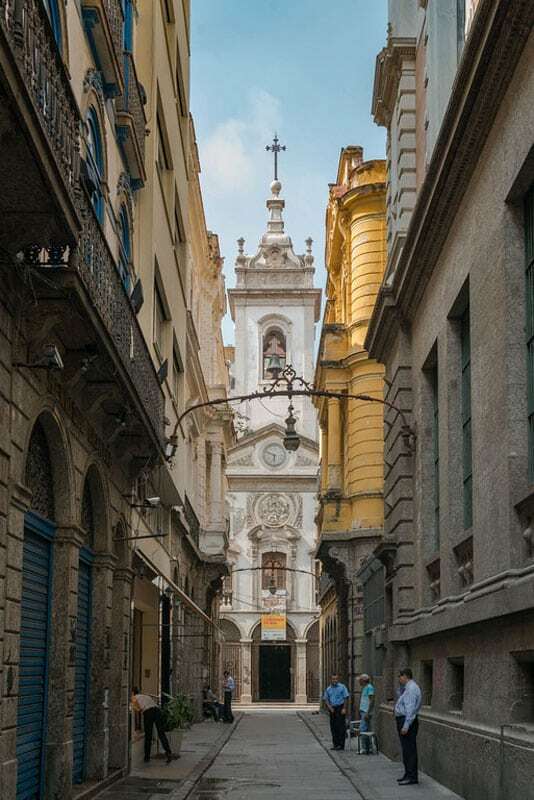 Downtown Rio is definitely worth spending a day to explore. The alleyways are charming mazes filled with cafés and stores. There's markets, cathedrals, museums and monasteries. If you get a chance, be sure to take a Rio City tour. 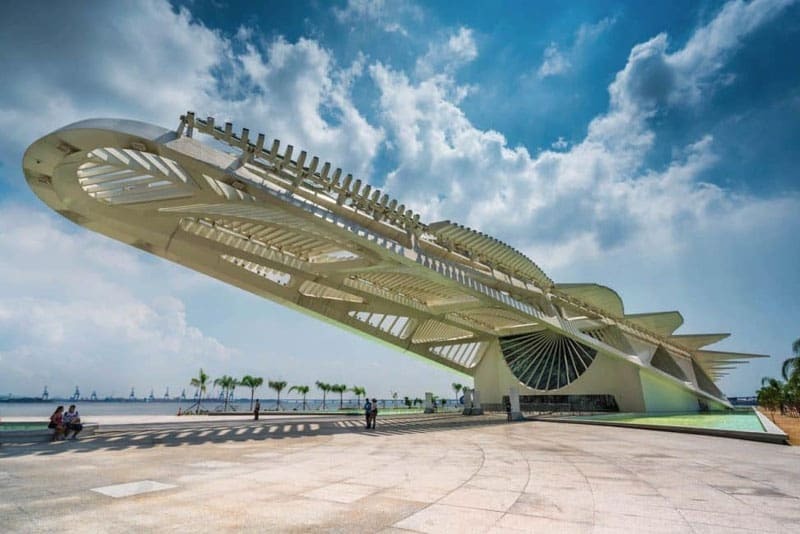 The Museum of Tomorrow is located on the waterfront of downtown Rio. Opening in December 2015, it is one of the world's most extraordinary architectural designs. While touring downtown Rio, you must make a stop at this museum. The museum is devoted to ways to avoid climate disaster, environmental degradation, and social collapse. Speaking of downtown Rio, it's highly recommended to get off the beach and explore the downtown core. 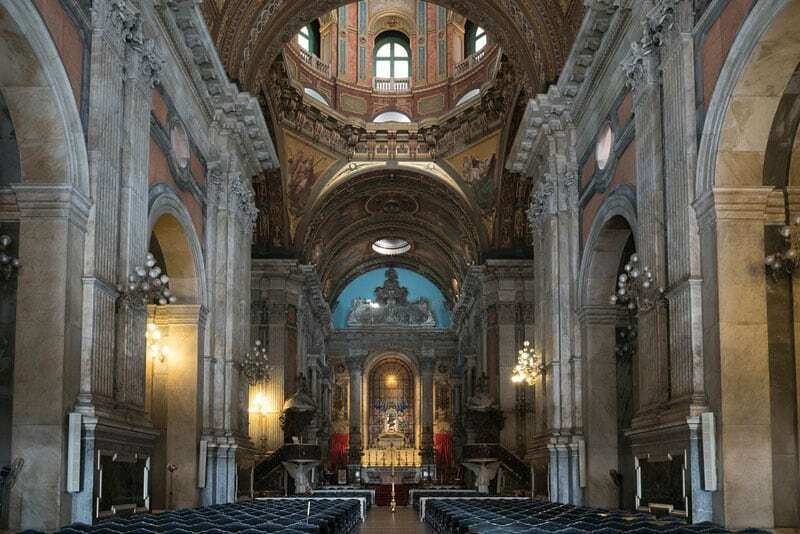 There are several historic churches and monasteries that you can visit on a city tour. The Monastery of St. Benedict is worth going inside to marvel at the walls and sculptures covered in gold leaf. The churches are beautiful in Rio. Church of our Lady of Lapa is a small church built by sea merchants in 1743. In 1893 a bomb landed in the building, but it didn't explode. It is believed to be a miracle and the unexploded bomb is still in the wall in the back of the church. A stark contrast is the modern Metropolitan Cathedral. It looks like something out of the Egyptian desert creating a pyramid in the centre of the city. It holds 20,000 people and is filled with huge stained glass windows. 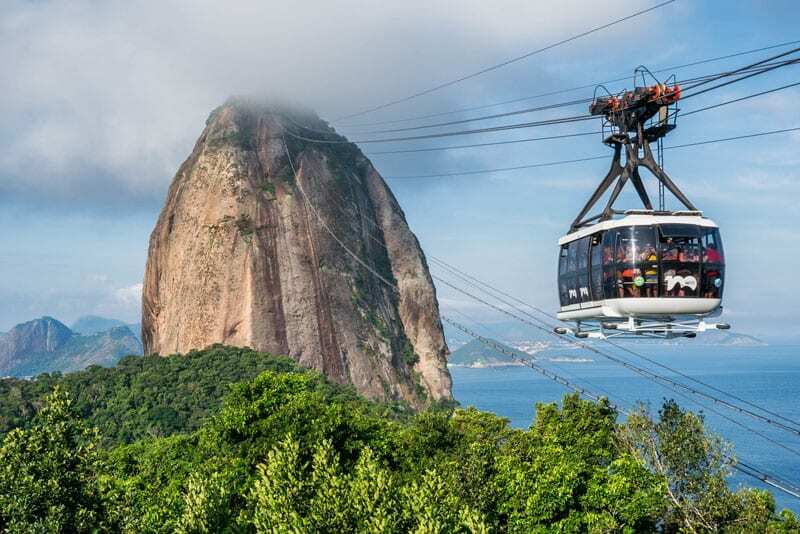 Don't miss these Exciting Tours in Rio! 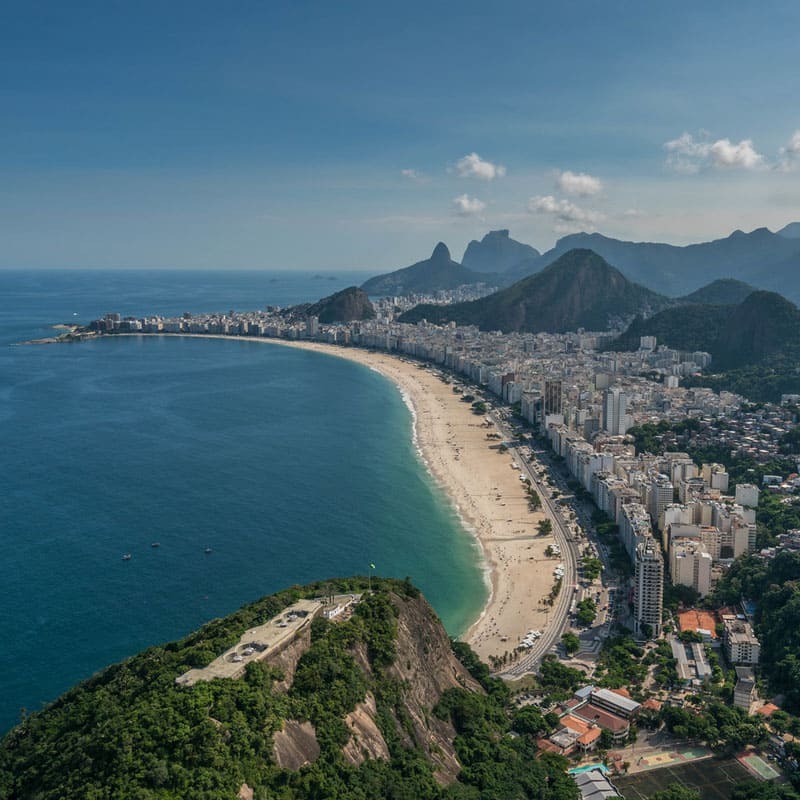 Many people feel that the best view of Rio is from Christ the Redeemer, but you actually get a far more stunning view from just part way up Corcovado at the Dona Marta Lookout. Standing at 275 meters high, it definitely gives you the best view of the city and the bonus is there aren't any crowds. Unlike Christo, this lookout is rarely shrouded in clouds. Hire a car and head there for sunset. 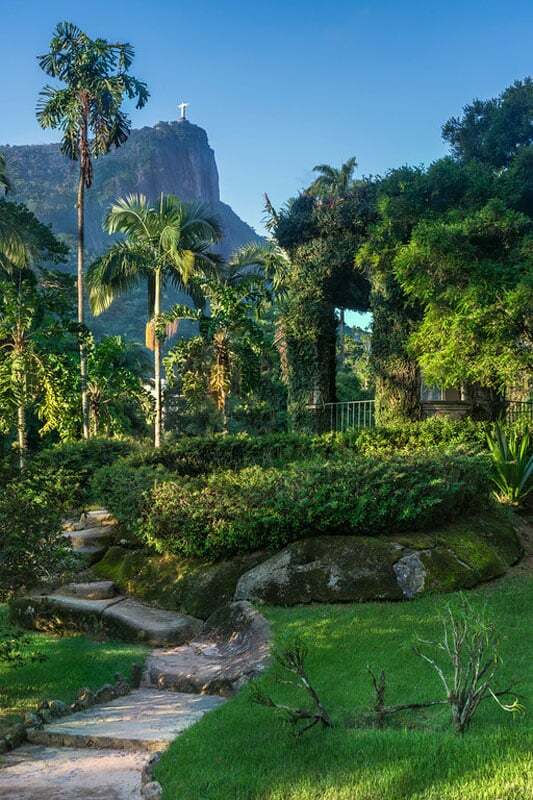 Now that you know all the things to do in Rio de Janeiro, check out where to stay in Rio. Every year Rio hosts the biggest party on earth. The Rio Carnival is legendary. 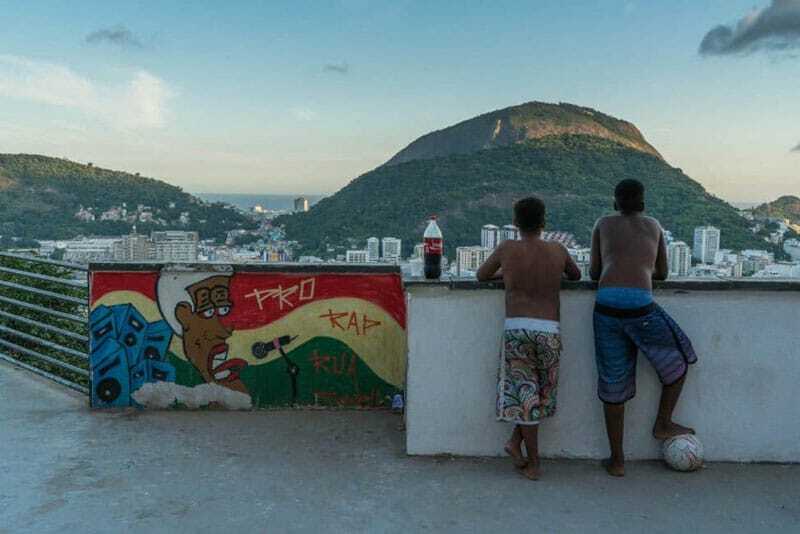 It's all about the samba culture and if you visit a favela you will learn a bit about it. Make sure to stop at the Sambadrome to see the parade route where schools compete for the title of best samba troupe. For a quiet escape visit the public park of Parque Lage. A mansion stands in the center of the park surrounding a pool where you can sit in a cafe and enjoy a cup of coffee as you take in the view of Christo above. There are walking trails and many families choose to picnic here on the weekend. The Santa Teresa neighbourhood is an artist community located at the top of Santa Teresa Hill. 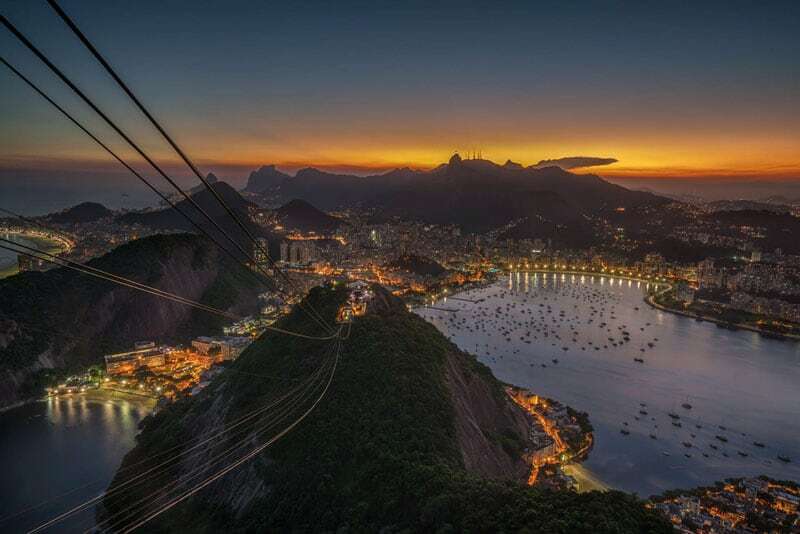 It is yet another place that offers fantastic views of Rio. Stroll through its winding narrow streets and you never know what you will find. There are public performances and artists at work. 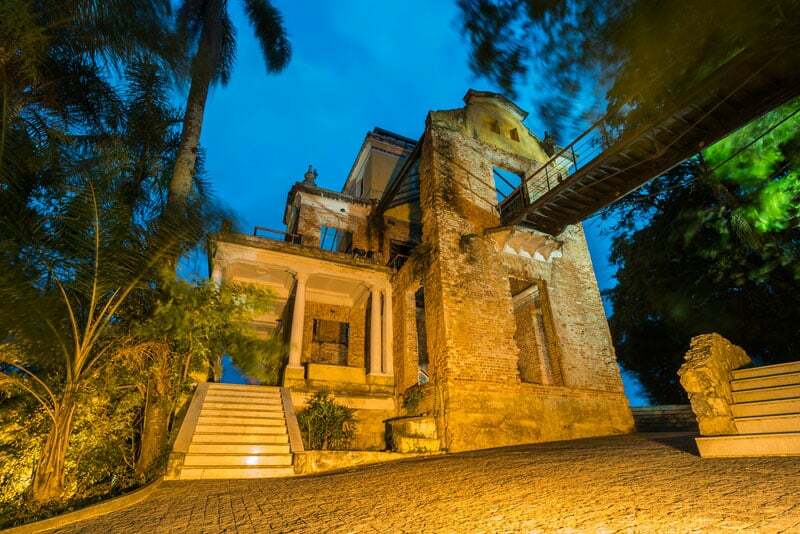 In the centre of Parque das Ruinas is the beautiful old mansion turned into a museum, the Museu da Chácara do Céu. It displays art by the likes of Matisse and Jean Metzinger. Another quiet retreat is the Botanical Gardens. There are 8000 plant species in the park spanning 130 acres of land. Pathways weave through tropical plants, ponds and trees. There are greenhouses, monuments and bridges decorating the picturesque setting. 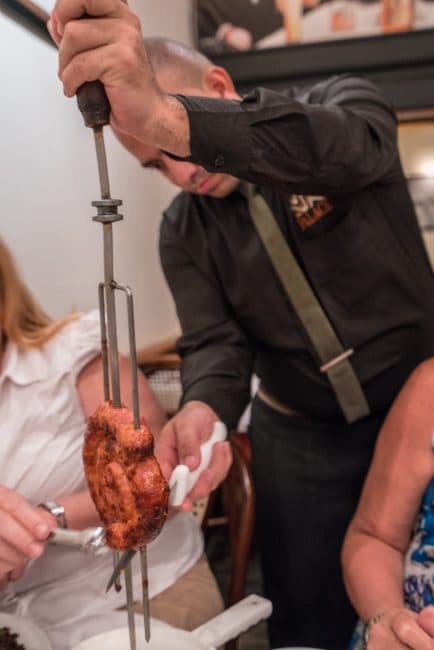 When visiting Brazil, you must try a Brazilian Barbeque. 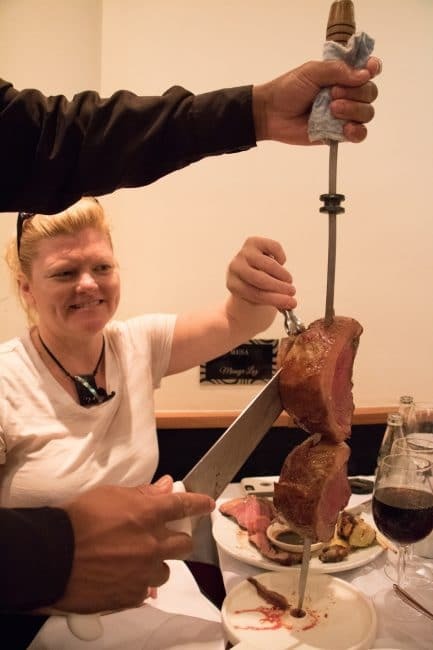 In Rio, the place to do this is the Churrascaria Palace. When you walk into this famous eatery, you feel as if you have stepped back in time. 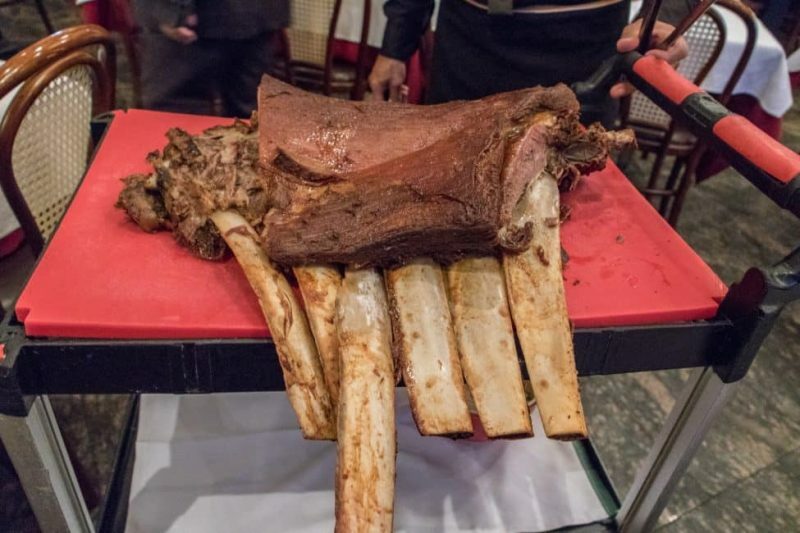 Waiters in black and white bring cuts of prime meat around to your table and slice off top cuts with skill and ease. 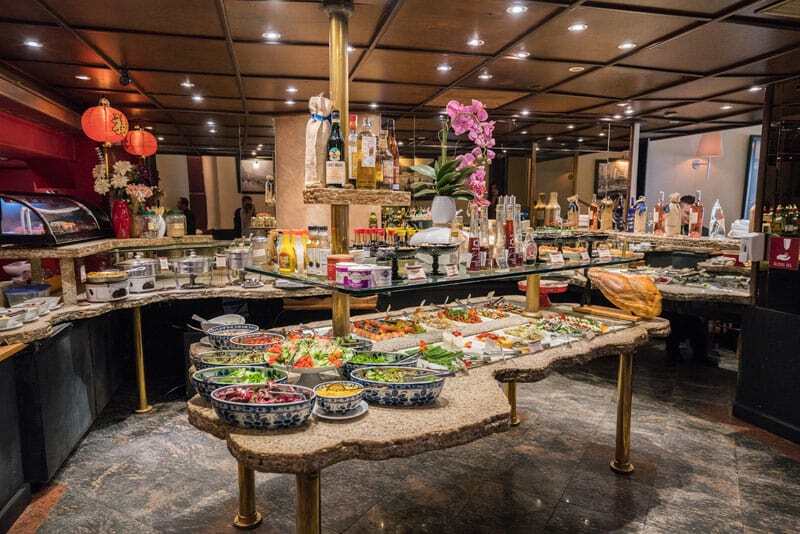 The meal begins at the salad bar that is filled with delicious treats like sushi, fresh fruits and vegetables, endless salads and bread. Don't fill up though, because the perfectly seasoned meats will keep coming to your table until you can't eat another bite. 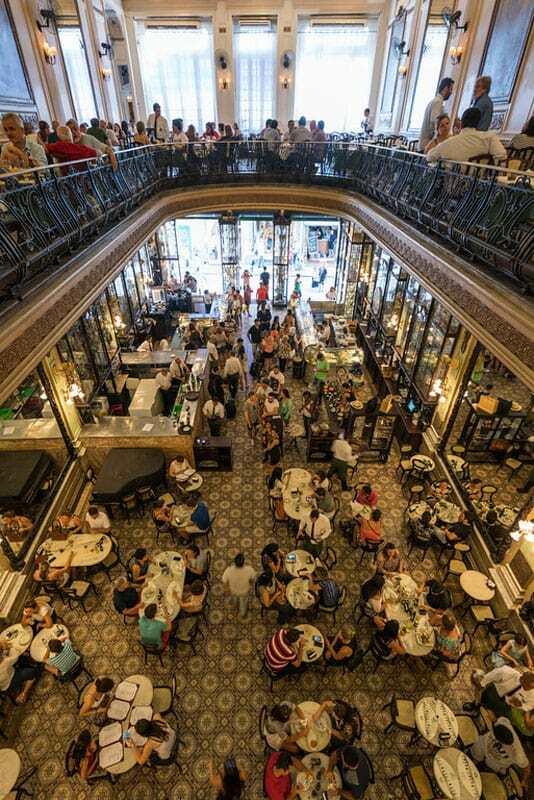 Another iconic stop for food is the Confeitaria Colombo. Built in the late 1800s, this Parisian style cafe serves pastries and desserts mixed with high tea. Many people stop in and browse the delectable treats downstairs. There is an upstairs dining experience as well where you can eat fresh food from the buffet while the piano man plays popular classic tunes throughout your meal. Take a ride on Rio's oldest elevator and peek over the balcony lets around a large oval looking into the chaos below. Don't Miss these Food and Shopping Tours! If you want some deals, the Mercado Popular is a great way to spend the afternoon. 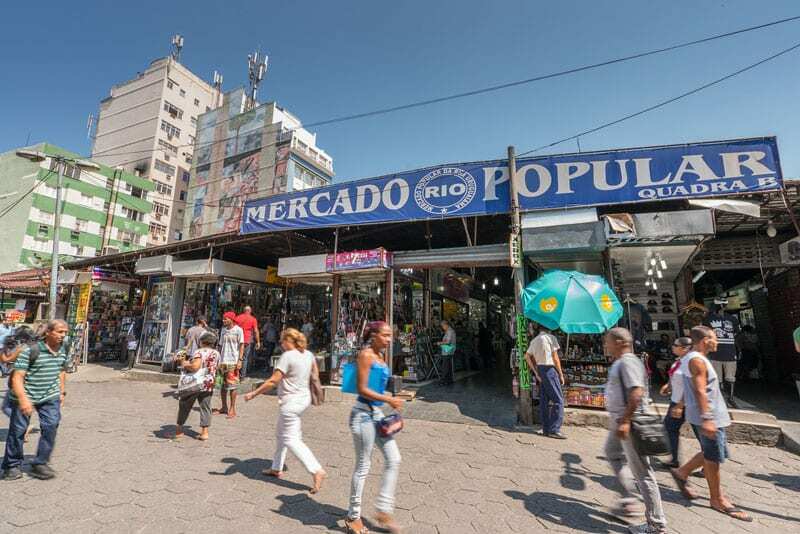 The vendors from Ipanema and Copacabana shop for their wares at this market so you can be sure you'll get a great deal. There are Haviana flip-flop shops everywhere. 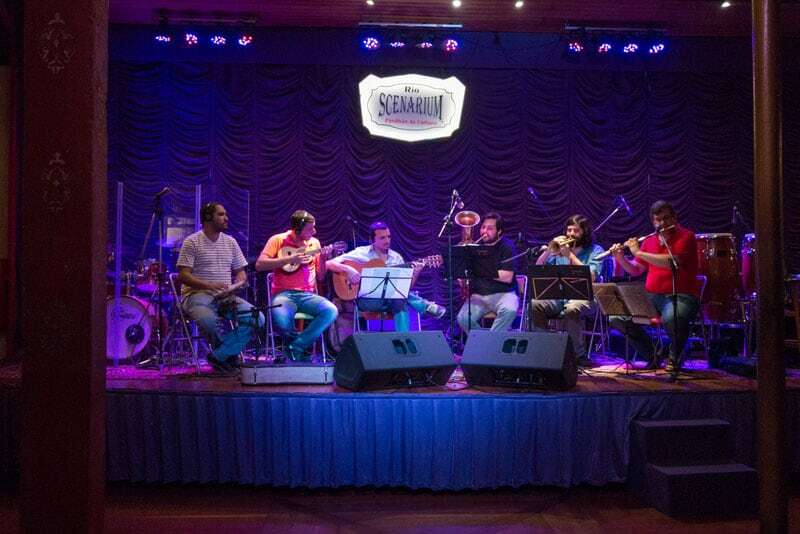 Rio Scenerium is just the coolest nightclub in town, as live bands play while Samba dancers show off their talents. With three floors of memorabilia, private rooms and quiet corners, it’s the perfect spot to spend an evening. Take some samba lessons and hit the dance floor. Everyone is very welcoming and you'll soon find yourself with a partner showing you the ropes. But if you aren't up for dancing, don't worry, listening to the talented bands play is worth entering alone. There are so many things to do in Rio de Janeiro, you'll never much more than a day or two to explore the city. Rio is spread out and congested with traffic, so be sure to give yourself plenty of time for sightseeing. 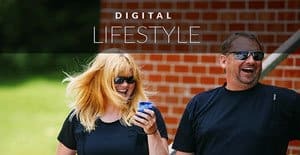 Private guides are an excellent way to get around as they can navigate through traffic, give you insider tips, and keep you out of the more questionable neighbourhoods. 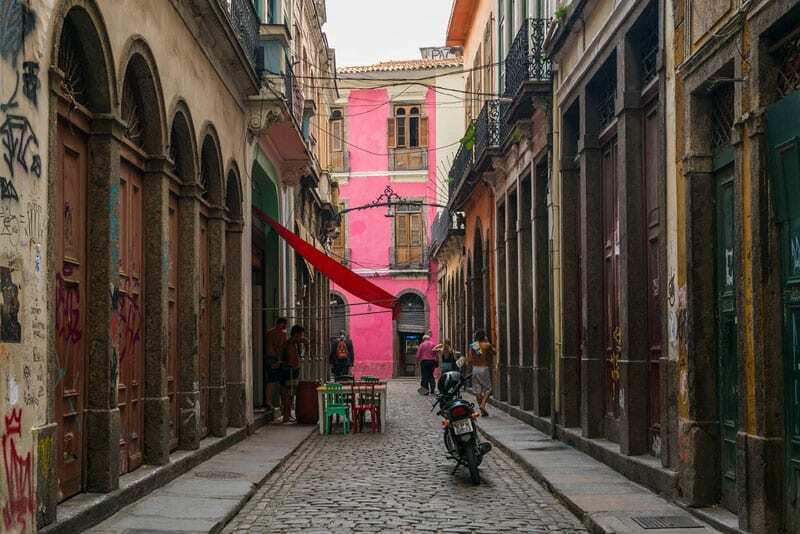 Rio is a city in progress, so be sure to stick on the beaten path. Did I miss anything? 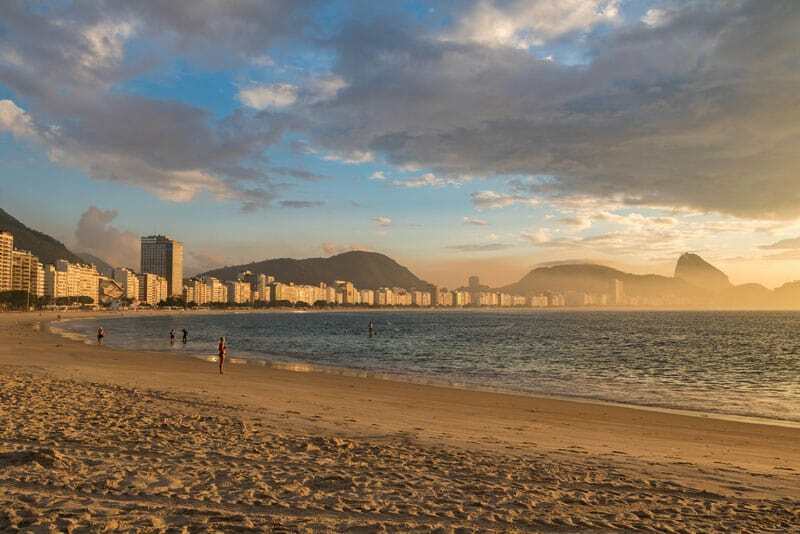 What are your favourite things to do in Rio de Janeiro? Check out the Top Tours in Rio! 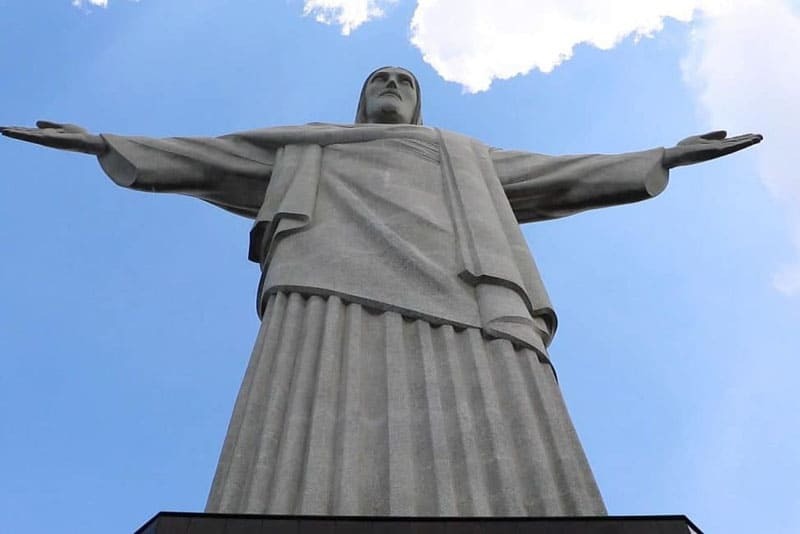 21 Responses to "The Top 18 Most Excellent Things to do in Rio de Janeiro"
I really enjoyed the pictures in this post! Brazil looks so colourful and so fun. I hope you enjoy the rest of your time there and can’t wait to see more of your adventures.. ?? Ipanema beach and Christ the redeemer are what I’m looking forward to. Nice list though. Rio is the most beautiful city in the world . They have beautiful ladies, amazing beaches and also is a paradise in the earth, ( with incredible mountains and also the Christ the Redemmer statue )! If you don’t know about Rio, don’t make comments . I went there several times and I felt safe. The city has problems like other big metropolies in the world . But is an awsome city . They have the most happy and friendly people that I ever seen in my life . The carnival , the samba and also the beaches make the difference ! That’s why Rio is a great city . And their music is really good. You have to listen “Garota de Ipanema” . Great post, thanks! I’d recommend as well hiking up Pedra da Gavea – challenging, but you get the absolute best view of Rio! It’s such an amazing and unique place. I haven’t been to Rio yet, but half of my family lives in Sao Paolo. Sao Paolo might not be the prettiest of all the places you can go (it’s a very urban town), but the people are the ones that paint the city with beautiful colours. Everyone is smiling, joking, having a beer and a barbecue. Everything is a reason for a party and after spending 2 months in Brazil to meet everyone from the family, I came back to home with 10 extra kilos! Why is that? We had a great time there and bought a few items. 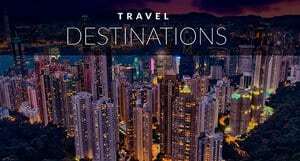 This is a great information to plan my next vacations to this destination. 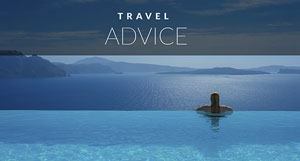 Amazing places and great things to do in Rio. I must say, just an amazing place! I loved this post. Every time you brings something new to read & plan. Thank for sharing such a great post. This is awesome to get me plan me tour through Rio. Thanks for this post. Something that has been on my bucket list for forever is Carnival in Rio. I’ve never really looked into what else you can do in there though, it’s safe to say that there are at least five more items added to my bucket list now, I’ll start planning my trip! Rio is one of those places that always catches my attention, but never quite enough to push me to book the trip. 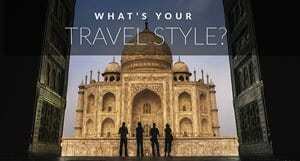 How long would you recommend staying for a first-time visitor? Hi Dave and Deb..You both ROCK!…Great YouTube video on Rio de Janeiro. Inspiring to watch. 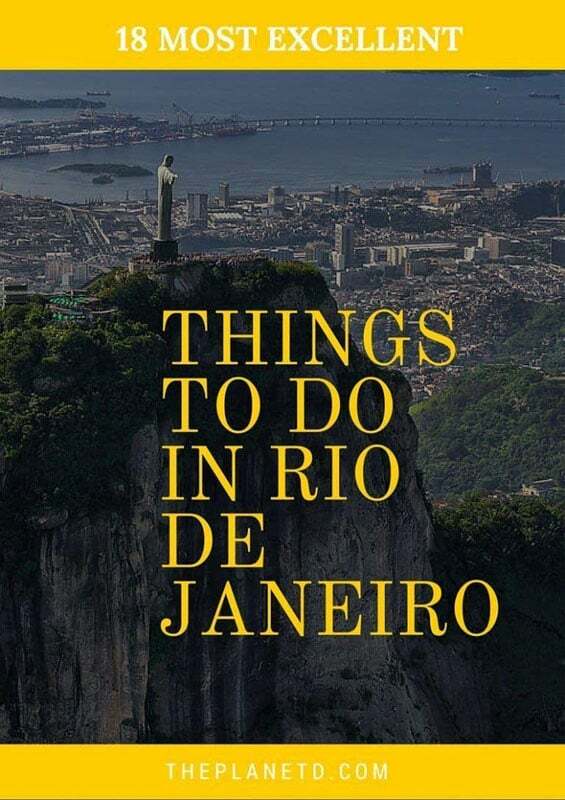 Really enjoyed this comprehensive guide for awesome things to do in Rio. Great pictures, the views are absolutely amazing….Envious!. This post makes me want to start packing. Christ the Redeemer is top on my list. I bet the mountain hike is killer… Did you contemplate the trek?….Great post..I’m gonna have to share this..
Hi Riley, thanks for the kind words. Sadly we took the train. We were on assignment so had a very busy schedule. If we go back, we’ll definitely do more hikes. We hear the Two Brothers hike is awesome as well.